A few days ago the good people of Kent experienced an earthquake which measured 4.2 on the Richter scale. This follows a quake of very similar magnitude not long previously, in 2007. Of course these are as nothing compared with the recent monster in Nepal and other quake-vulnerable spots around the world. The epicentres of “our” disturbances tend to be in the Channel or Kent. But in past times there have been ones centred here in London. A strong tremor rocked London at about 2 in the afternoon during a church Synod at Blackheath which had been convened to pass judgement of 24 Articles of John Wycliffe’s teachings. It naturally became known as the Earthquake Synod. It was presided over by the Archbishop of Canterbury, William Courtnay. A learned man, Courtnay – following Aristotle – explained to the terrified delegates that it was simply the Earth naturally expelling noxious fumes. Wycliffe’s followers, the Lollards, on the contrary interpreted the quake as God’s anger at the Synod. This earthquake caused sufficient turbulence in the Thames to capsize boats and quite severely damage St Paul’s. Better known than the medieval quake were two which struck a month apart in 1750. We are, after all, now in the age of the printed word, and in abundance: Gentleman’s Magazine had much to say, for example. At about midday on 8 February. It was very localised in the City. There were reports of a chimney collapsing and the usual chattering crockery, but with no injuries reported it was clearly a minor, albeit alarming affair. Exactly a month later on 8 March, a more powerful tremor struck the city in the small hours. There was much actual damage to buildings, crockery, furniture. Dogs howled and folks sprinted into the streets in various states of undress. The bishop of London insisted that divine retribution was at hand on account of London’s wicked ways. Exactly another month later, many superstitious and gullible Londoners, headed out of town. Just to be sure. LH Member, the Georgian Gentleman, has a great write-up of the 1750 quake. Other good coverage of this quake here. So wrote Punch magazine in 1882 about the man who more than anyone gave us that strangely and quintessentially British-named institution: the bank holiday. 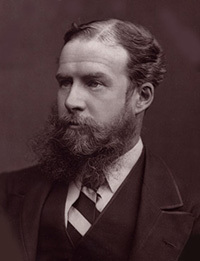 Londoner Sir John Lubbock Bt. (1834 – 1913) was the archetypal Victorian man of affairs. A successful banker, an MP, a philanthropist, a keen amateur scientist. Lubbock was the primary sponsor of the Bank Holidays Act 1871, which introduced four bank holidays under Law: Easter Monday, Whit Monday, the first Monday in August and Boxing Day. These have been added to or changed under subsequent Acts, the most recent being 1971. Because some of the Bank Holidays can fall on the weekend, the dates have to be fixed each year by Royal proclamation. Christmas Day and Good Friday were already holidays under the Common Law and therefore are not official Bank Holidays. But why bank holidays? Until 1871 – led by the Bank of England – most banks gave their staff the day off on selected saints’ days. Sir John Lubbock felt it would be rather nice if this boon in some small measure was spread to the wider national workforce. No person is obliged to pay any debt or transact any business on days such designated. Three cheers for Sir John!